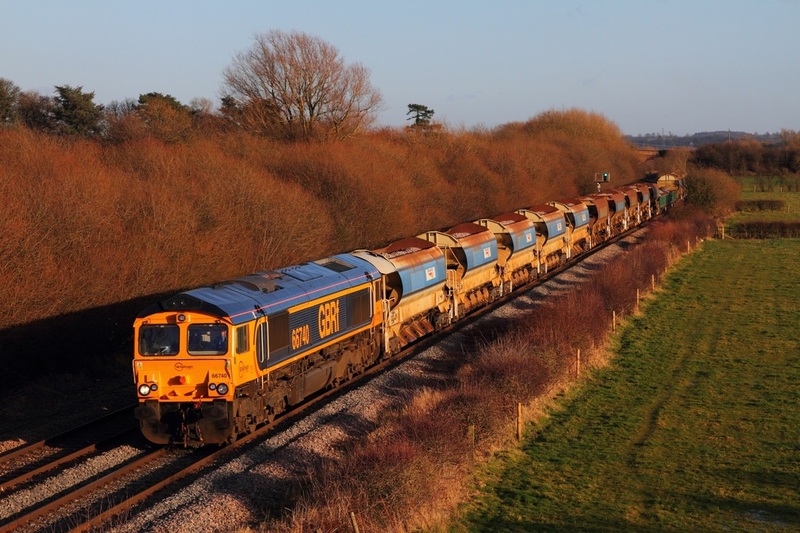 GBRf 66707 hauls the 6K50 Toton to Crewe Basford Hall at Barrow upon Trent on the 21st February 2014. DB Schenker's 67026 on hire to East Coast for ECML thunderbird duties, pilots DVT 82226, EC set BN23 and 91107 (named 'Skyfall') as train 5E02 09:19 Newcastle to London Bounds Green depot at Claypole, south of Newark on the 18th February 2014. Train 1E02 05:48 Edinburgh to London Kings Cross failed at Newcastle following power issues with the DVT 82226. The train was subsequently terminated and rescued by 67026 which took the ECS to London. Sky 1 HD liveried 91125 now reunited with its matching BN25 set, blasts through Claypole hauling the 1D10 10:35 London Kings Cross to Leeds service on the 18th February 2014. 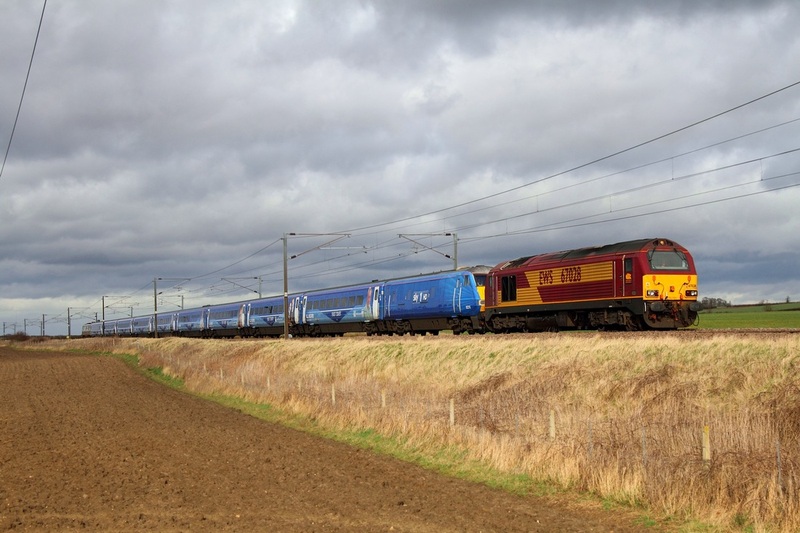 DB Schenker's EWS liveried 67028 leads Sky1 HD Set BN25 and 91117 on the 5E05 1140 Doncaster to Bounds Green at Frinkley Lane, Marston on the 15th February 2014. 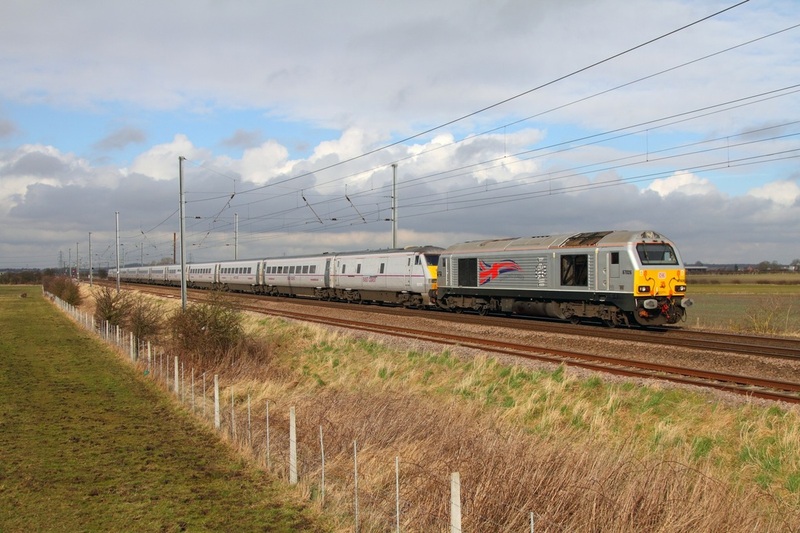 The 1E05 0730 Edinburgh to Kings Cross had terminated at Doncaster after striking a wooden object south of York. 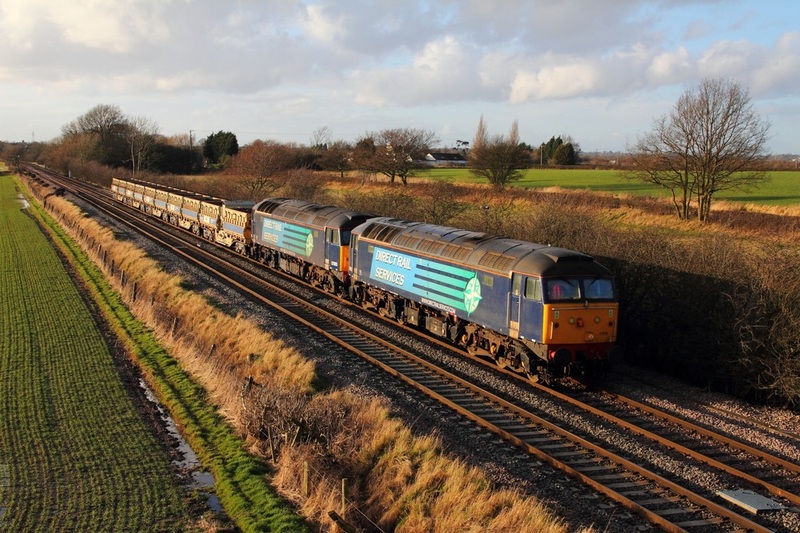 DRS 57012 leads 57003 on the 6Z96 Crewe Basford Hall to Toton at Barrow upon Trent on the 11th February 2014. 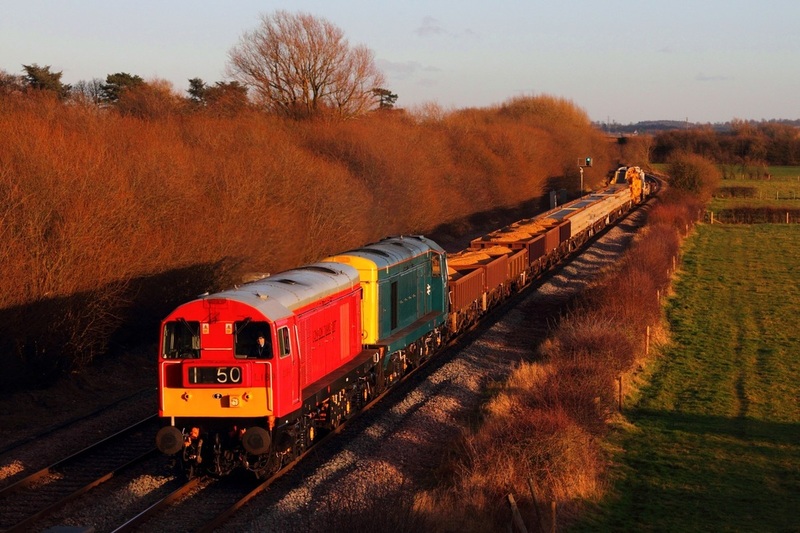 DRS 57010 leads 57008 on the 6U77 Mountsorrel to Crewe Basford Hall loaded ballast stone at Barrow upon Trent on the Castle Donnington branch on the 11th February 2014. 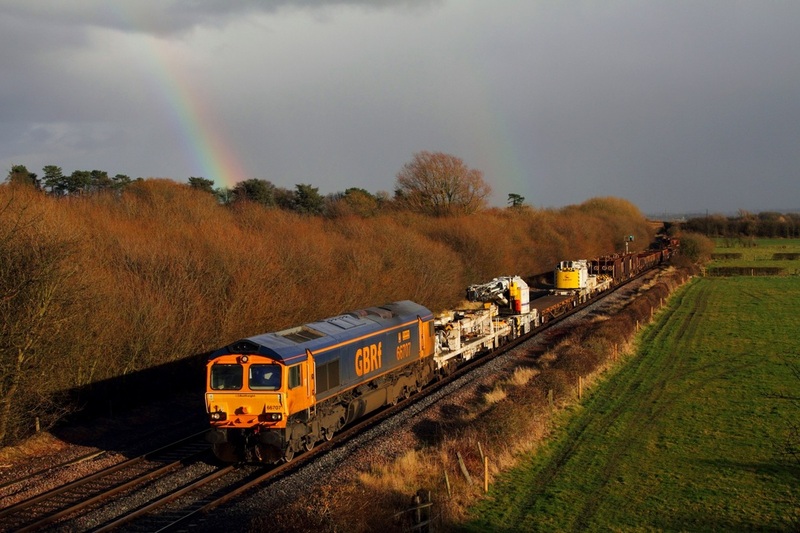 GBRf 66740 works the 6K50 Toton to Crewe engineers at Barrow upon Trent on the 11th February 2014. 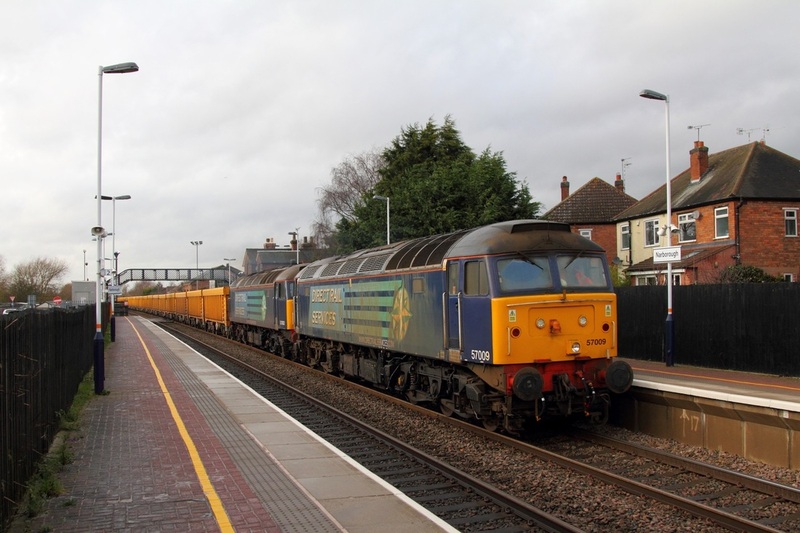 Freightliner's 66549 works the 6M49 Hull to Rugeley at Barrow upon Trent on the 11th February 2014. 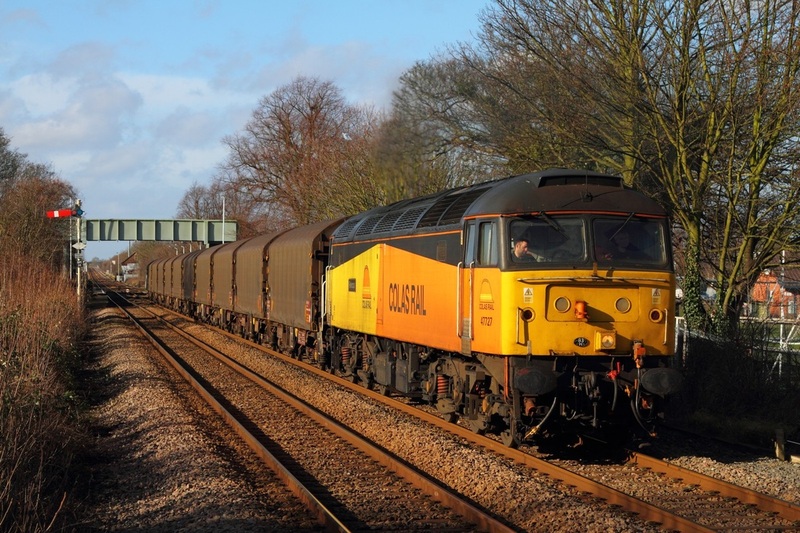 Still going strong, Colas Rail liveried 47727 hauls the 6E07 Washwood Heath to Boston Docks at Bingham on the 8th February 2014. 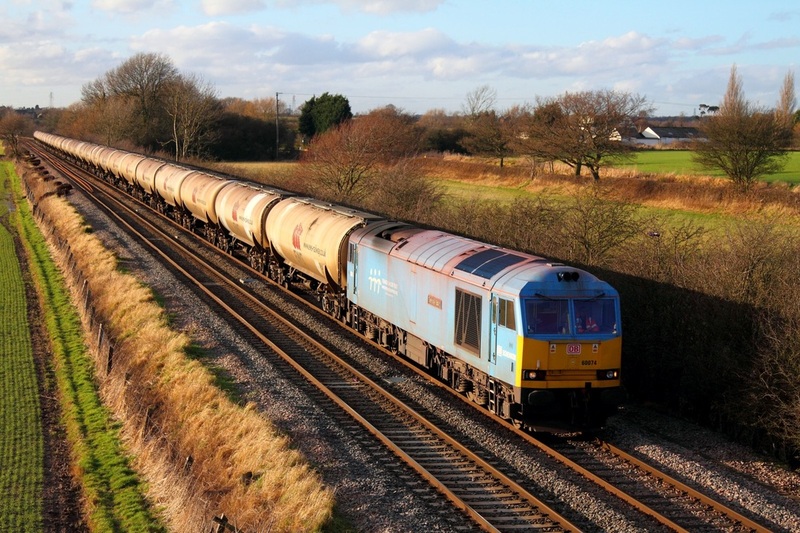 Having worked the 6V98 Lindsey to Westerleigh, DB Schenker's Sky blue work-stained 60074 returning working the 6E41 Westerleigh to Lindsey tanks, captured here at Barrow upon Trent east of Stenson junction on the 7th February 2014. 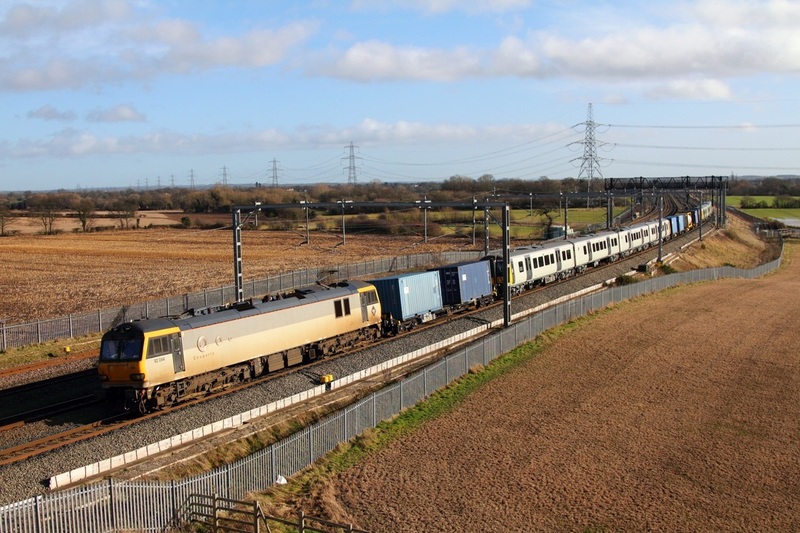 New DRS 68002 brings up the rear of the 5Z73 Derby to Crewe at Willington on the 6th February 2014. 47501 was hauling the train. 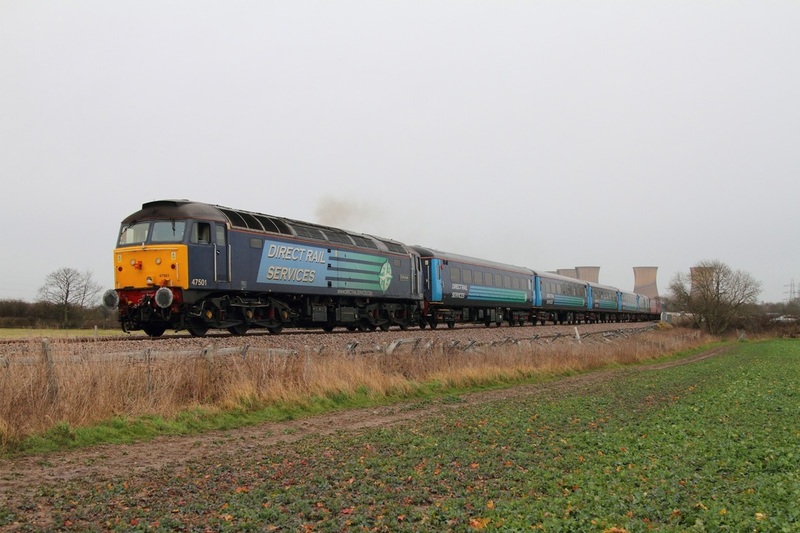 DRS 47501 returns with the 5Z73 12:56 Derby to Crewe at Willington with new 68002 on the rear of the train on the 6th February 2014. 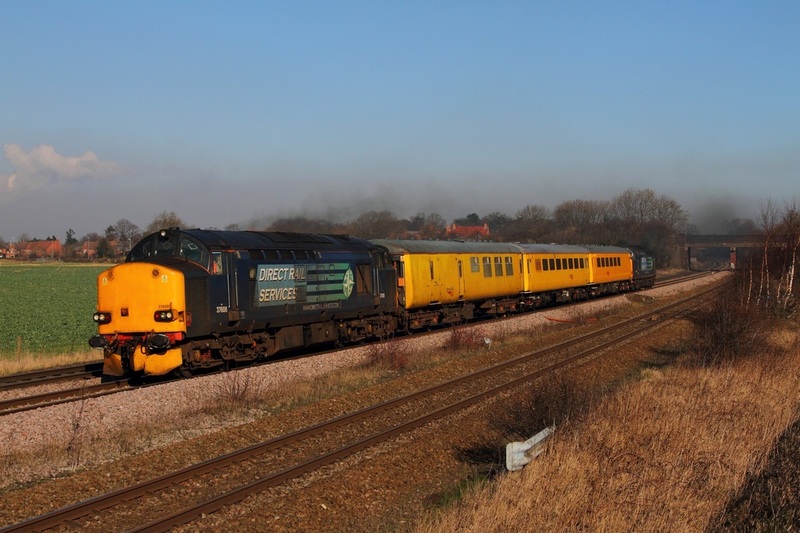 DRS 47501 leads 68002 on the 5Z72 Crewe to Derby at Willington on the 6th February 2014. 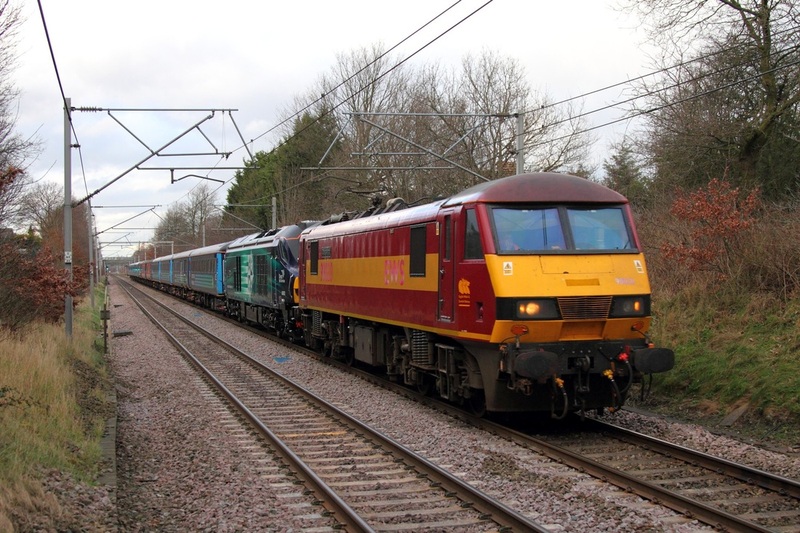 DB Schenker's EWS 90020 leads DRS 68002 on the 5Z69 Carlisle to Crewe at Winsford test run on the 4th February 2014. 6U76/6U77 contract now in the hands of DRS... Ronnies on Yellow Boxes!! 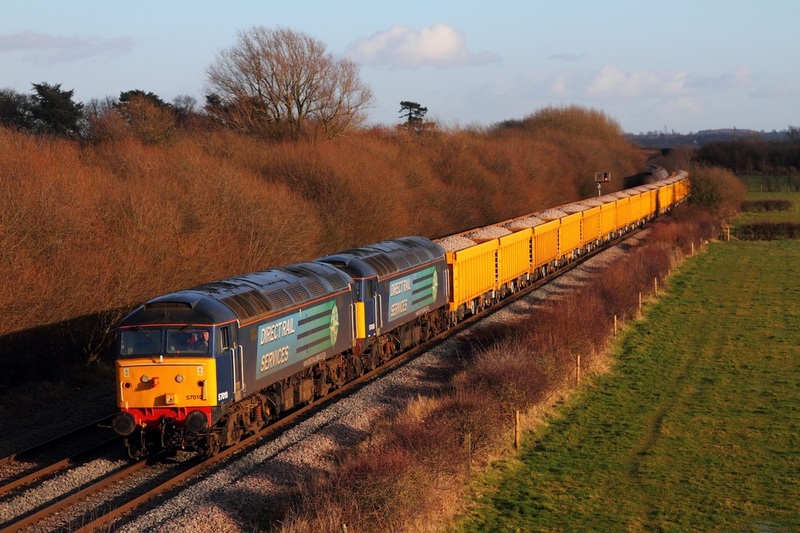 DRS 57009 leads classmate 57002 on the 6U76 08:59 Crewe Basford Hall to Mountsorrel empty ballast boxes at Narborough near Leicester on the 3rd February 2014. 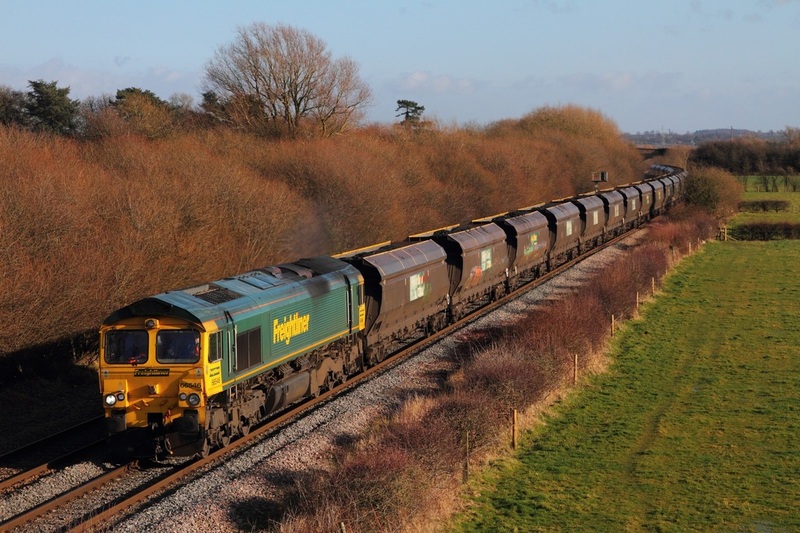 DRS now have the contract for the 6U76/6U77 services which were previously held by freightliner. As the train is too heavy for a single class 66/4 hence why the train under freightliner control was either hauled by class 66/6 or class 70. 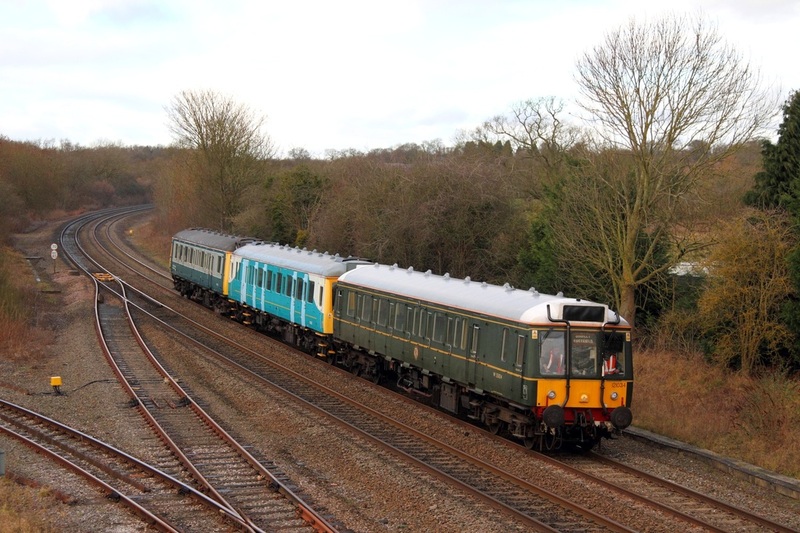 The service was hauled by a pair of DRS Class '57s'. This was the maiden working of the train under DRS operation and was the first time class 57s have featured on this train. The train at this point was only a few minutes down following 170638 on the Leicester service, however the returning 6U77 departed Mountsorrel 87 late. 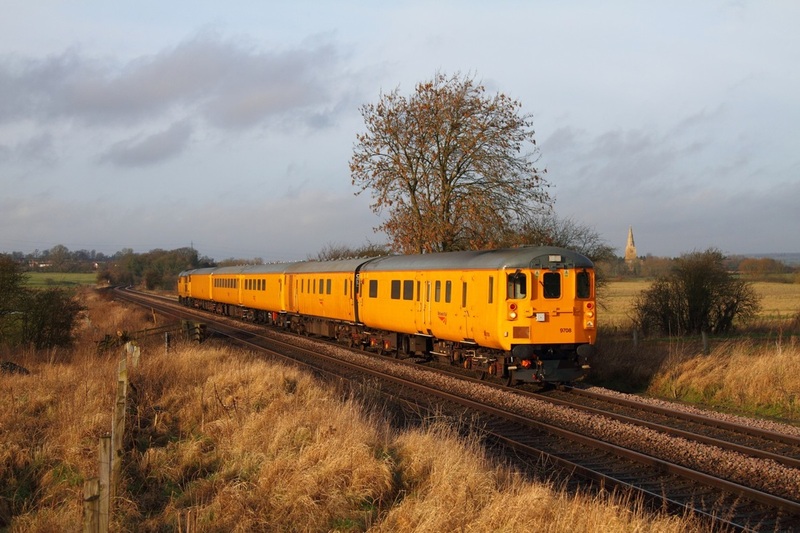 DBSO 9708 being propelled by Network Rail's 31285 cruises through Copleys Brook near Melton Mowbray with the 3Z10 Derby RTC to Old Dalby on the 3rd February 2014. GBRf 92044 leads the 6X50 04:20 Dollands Moor to Trafford Park at Lichfield Trent Valley on the 1st February 2014, consisting of 8799800019, 8799800027, 8749061283, 8749061283, 8799800035, 8799800001 L IFA wagons and new Desiros 350407 and 350406 having been transported from Siemens factory in Germany via the Channel Tunnel. 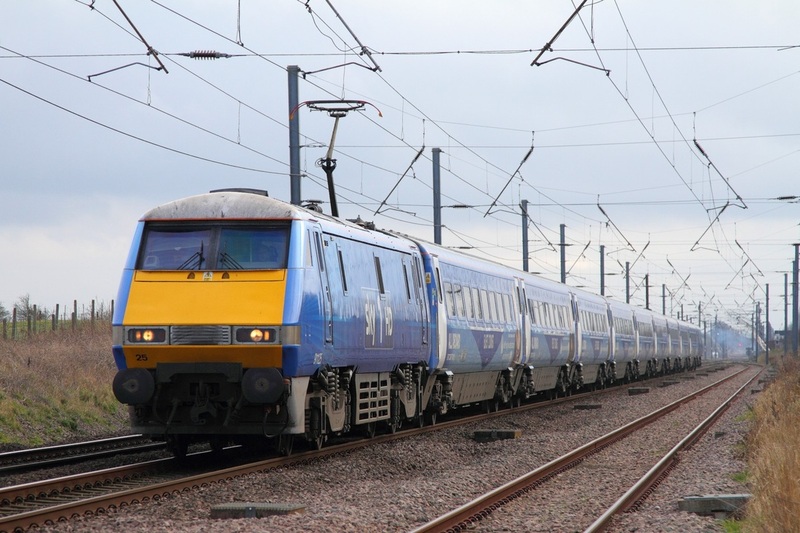 The four-car electric multiple units are for the Trans Pennine Express franchise following the electrification of the Liverpool to Manchester route via Newton-le-Willows and will presumably replace the Class '185s' on the Manchester to Scotland services, although only a total of 10 have been ordered so some services will remain scheduled for the non-electric class '185s'. 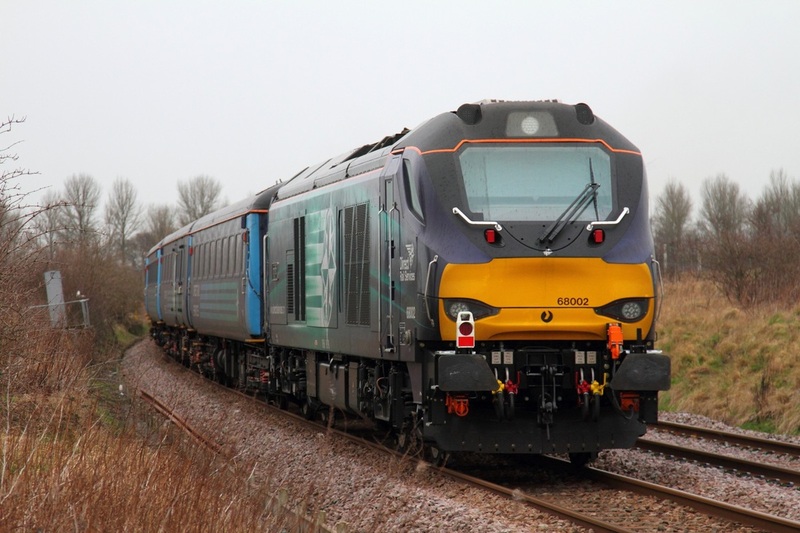 London Midland have ordered 10 four-car class '350/3s which will provide extra seating capacity and will eventually boost its current class '350' fleet to a total of 77.